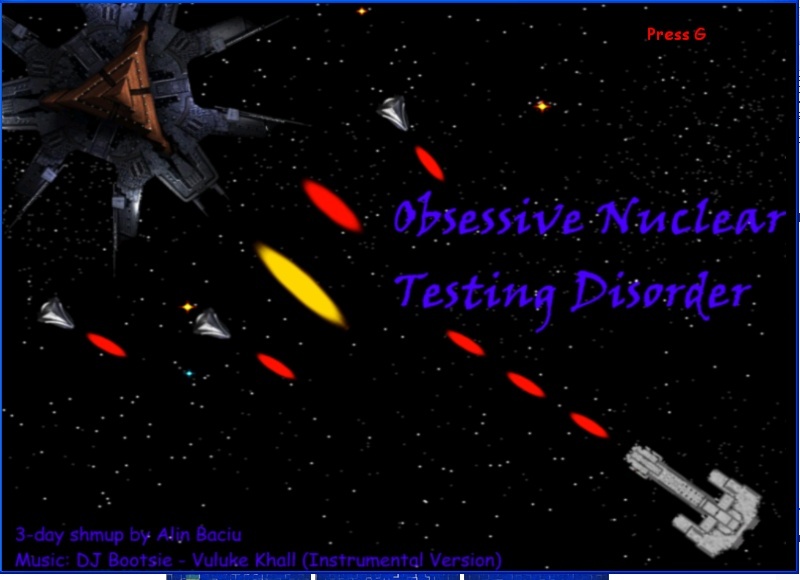 Obsessive Nuclear Testing Disorder | AwkwardGames - Quote: "AwkwardGames ftw!" Earth scientists have developed a new kind of nuclear bomb. Your goal is to test it. Get the multiplier as high as you can, then use a nuke to get the highest score you can. If you get hit, the multiplier will reset. The only score that matters is the one gained by using the nukes. You will receive a nuke every 7000 points. You’ve got 7 waves to get the score as high as you can. Good luck! Make sure you have the latest DirectX version and Visual C++ 2008 SP1 Redistributable Package installed. Obsessive Nuclear Testing Disorder uses Chorus Engine (home-brew). Comments and cryticism are welcome. 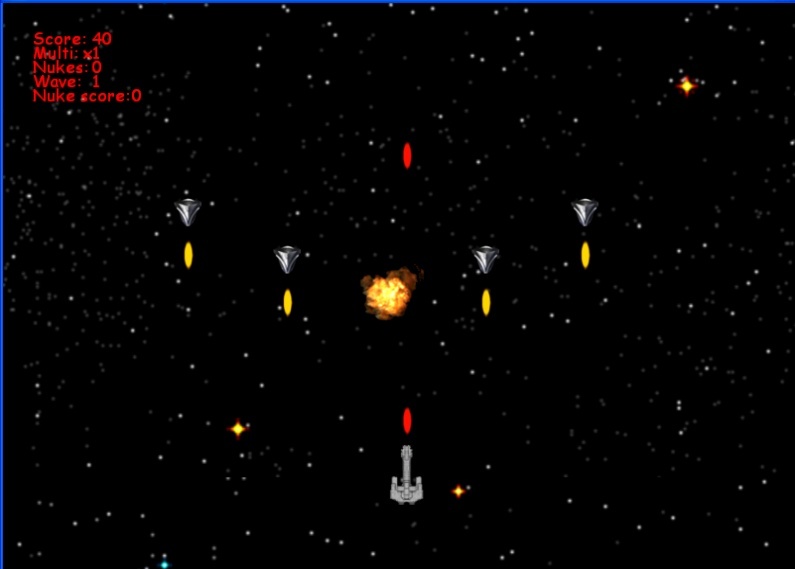 This entry was posted on July 11, 2009 at 20:28 and is filed under 7-day games, aw-games, awkward with tags 2D, Alin, Baciu, Chorus, disorder, experimental, Fmod, game, gameplay, nuclear, obsessive, prototype, stargate, Tayron, testing, unexperimental, vertical, windows. You can follow any responses to this entry through the RSS 2.0 feed. You can leave a response, or trackback from your own site. Well it’s not bad, but the laser sound could be turned down a bit. The game is a little easy considering that you cannot die [like, I’m a huge fan of God Modes, but c’mon]. It’s great for a 3 day game. Good luck with your projects Tayron. well, dieing is not the point….you have to get the multiplier as high as you can and nuke everything in order to get the score as high as you can…. The game’s broken, because the nukes also generate points needed to make nukes. They also always add one to your multiplier, so you never run out. I found this out around wave 6 and finished the game with a x143 multiplier and 80ish nukes, without killing a single enemy with my main attack. Also, it took me a while to figure out that your modifier is reset to 1 after a set amount of time (and that this time is less than the time between waves), effectively forcing you into the strategy of “not killing everything once”, which is something you normally expect at shmups. While that’s obviously fine, some feedback on this would have been appreciated during game play. – Don’t base gaining nukes based on points. Instead, base it on the number of enemies killed WITH YOUR STANDARD WEAPON. 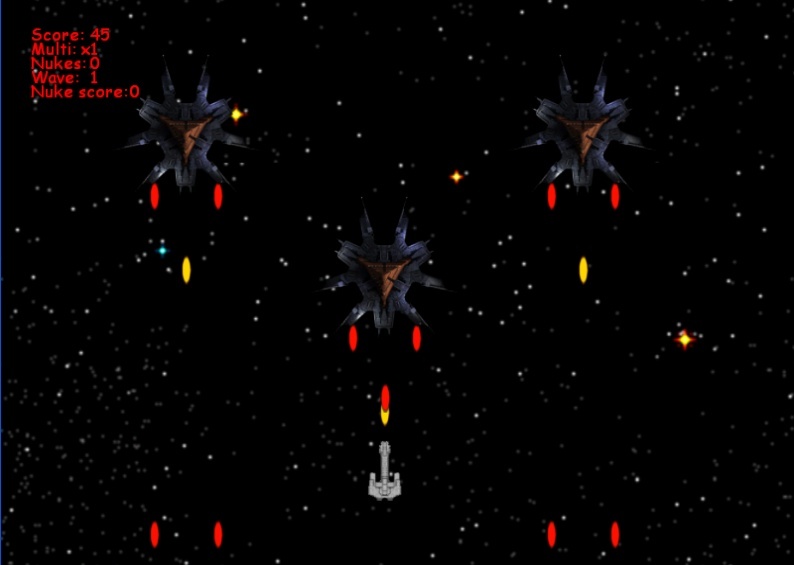 – Provide some clear feedback that your multiplier is going to run out because you didn’t kill an enemy in time. – The 7 waves seem almost identical. Maybe they can spawn quicker? More enemies? Faster firing rate? Nice straightforward concept and gameplay. I was easily engaged in the concept and felt it was pretty fun. Thank you a lot for giving everyone an extraordinarily superb chance to read articles and blog posts from this blog. It really is so pleasing and as well , packed with amusement for me personally and my office fellow workers to search your web site at least 3 times per week to learn the new items you have. And indeed, I am also actually impressed for the wonderful suggestions you serve. Certain 4 facts in this article are easily the best we have all ever had.